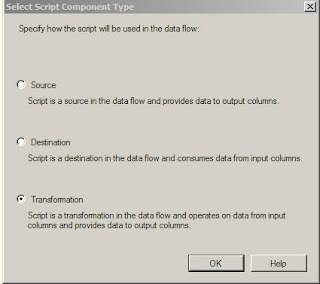 Recently I used a Script Component in the data flow task within SSIS. I decided to use the component has a means to do data transformation. There are lot of different ways to do transformation within SSIS, but i just wanted to check out how SSIS Script component performs. Here is a link to Linkedin MSBI group where i had posted a question on how script component would perform: Lot of folks have suggested different strategies on how to go about the data transformation. 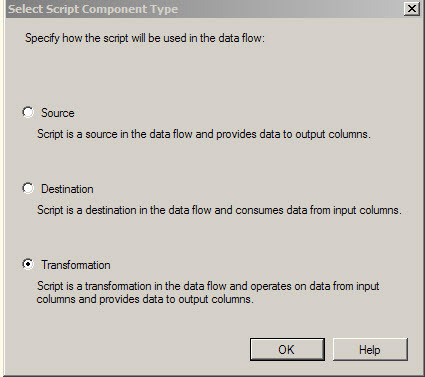 When one drags a script component on to the Data flow task editor, here is the screen dialog that pops up. Use Combination of LOOKUP and Conditional Split to figure out new records/changed records. Use EXECUTE SQL task and call a stored procedure to perform data transformation.